Hereditary diffuse gastric cancer (HDGC) is a rare autosomal dominant cancer susceptibility syndrome caused by germline mutation of E-cadherin (CDH1) gene. Mutation carriers have a more than 70% lifetime risk of developing HDGC. To best of our knowledge, we are reporting first US case series of 6 patients of single family, who underwent prophylactic laparoscopic total gastrectomy for HDGC. Patients were identified as CDH1 carriers from a single family (Earlier 2 family members died of advanced diffuse gastric cancer). There were 3 men and 3 women. The mean age was 38 years (range, 21 – 52 years). No patient had any signs or symptoms of gastric cancer. All patients had been screened with esophagogastroduodenoscopy beforehand and were negative. All patients underwent laparoscopic total gastrectomy with retrocolic Roux-en-Y esophagojejunostomy. Surgical specimen of each patient (6 of 6, 100%) found to have multiple foci of T1 invasive diffuse gastric adenocarcinoma (signet-ring cell type). No patient had lymph node or distant metastases. Each was staged as T1N0M0. One patient developed herniation of small bowel through mesocolic window in immediate post operative period, which required surgical correction. Same patient developed esophgojejunal anastomotic stricture later, responded well to dilatation. Remaining patients are doing well with 15-17 months of follow up. Endoscopic surveillance of patients with CDH1 mutations is ineffective because early foci of HDGC are typically small and underlie normal mucosa. 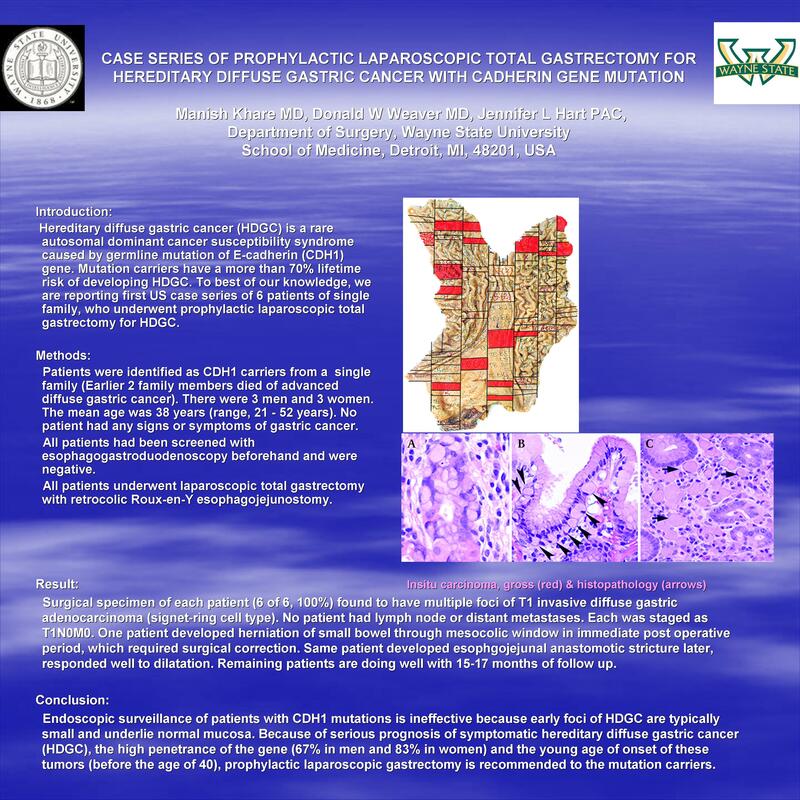 Because of serious prognosis of symptomatic hereditary diffuse gastric cancer (HDGC), the high penetrance of the gene (67% in men and 83% in women) and the young age of onset of these tumors (before the age of 40), prophylactic laparoscopic gastrectomy is recommended to the mutation carriers.